The variations in homebrewing starter kits are staggering, and it’s a constantly growing list of available options. But what equipment do you really need to start homebrewing? You really don’t need to know that much about homebrewing if you decide to go with an automated brewing system; but the old-school way will definitely involve a bit of research as the items and information available can be very confusing. Let’s break down each phase of the brewing process, and list each part of equipment you need along the way. During wort creation, we are making the sugary solution that becomes beer after it’s fermented by yeast. There are two practiced methods for wort creation, extract or all grain and the equipment needs by each method do vary quite a bit, so I will split them up here. Extract brewing requires less equipment, so we’ll begin there. 8+ Gallon Brew Kettle: There are specialized stainless steel kettles built specifically for brewing. Some have extra bells and whistles, that do help with brew day but aren’t required. A simple steel or aluminum kettle will work just fine. You will need to create an oxide layer on a new aluminum kettle by filling it with water and boiling for 20 minutes. Then dumping the water. This only needs to be done once. Your kettle should be at least 8 gallons for a 5-gallon boil. However, 10 gallons (40 quarts), would be ideal. During the boil, proteins expand and nucleate (foam up), and hot sugary foam will pour over the sides of your kettle if you aren’t paying attention. Heating Source: There are a couple ways to heat your wort up to a boil. Typically, a stove top is not strong enough to boil 5 gallons of wort. The most common way to heat wort to a boil is a propane burner. However, there are also electric systems (typically require a 220V outlet), where you can use an electric heating element that is installed in the kettle to boil the beer. If you only have a 120V outlet, you can use a small electric element, and use it in addition to your stovetop to heat the wort. Long Spoon or Mash Paddle: Although extract brewing doesn’t require a mash paddle, as there is no mashing involved. Using a long spoon (24”-36”) or mash paddle will be required for stirring extract into the water to prevent clumping and scorching. Wort Chiller (optional): You don’t need a wort chiller, but having one will reduce your brew day time by about an hour. It will also reduce the chance of an infection taking hold in your beer. An infection is a fermentation by bacteria or yeast separate from what you intended on pitching. Infections can make your beer sour (lactic acid bacteria infection) or like hay (Brettanomyces infection). A wort chiller works by running cold water through a copper or stainless steel tub that is submerged in your beer once the boiling stage is over. Copper and Stainless steel transfer the heat into the water running out of the coil, cooling down the beer in 15-30 minutes depending on your groundwater temperatures. Thermometer: You will need a thermometer to check your wort’s temperature before transferring it to a fermenter and pitching yeast. If you’re looking to brew all grain, you will need some extra equipment as well. Mash Tun: A mash tun is often an igloo style cylindrical or rectangular cooler (for heat retention) with a false bottom and ball valve drainage port. If you’re a DIY type of person, you can build your own like this, or buy one pre-fabricated and ready to go. A Small Kettle (5 Gallon): This is to be used as an HLT, or hot liquor tank. An HLT simply stores hot water for sparging. They typically have a ball valve drainage port. The drainage port allows you to the HLT above the mash tun, and drain hot sparge water onto the grain. An HLT without a drainage port will require you to lift and tip a kettle full of hot water (not ideal). Brew in a Bag Bag or BIAB (optional): A more affordable option for all grain brewing is to replace the HLT and mash tun with a BIAB bag. This lets you mash your grains directly in the kettle. Just put the bag in the kettle filled with hot mash water (165F), add your crushed grains to the bag, and remove the bag of grains once the mash is complete. During the fermentation stage, you are adding chilled wort to a fermenter, and pitching yeast. The yeast fermented the sugar in the beer, creating alcohol. Hydrometer: This measures the amount of sugar remaining in your beer. Take a reading just before pitching the yeast. Then take a reading after two weeks. There are free online calculators that you can plug these two numbers (starting and final gravity) into to determine the ABV of your beer. Fact: You can not determine the ABV of the beer by taste, smell, or even how drunk you feel (as there several variables to this). Star San or Iodophor: Both of these are sanitizers. They will kill bacteria living in your fermenters for testing equipment. Anything that touches your beer after the boil should be sanitized before your beer touches it. Star San is no rinse and can be stored in a spray bottle for easy use. Bucket or Carboy: You will need a bucket or carboy to serve as a fermenter for your beer. It will need to be large enough to hold all of the wort and have several extra inches of headspace to allow for foam buildup during fermentation. Stoppers and Airlocks: Carboys require a rubber stopper that will fit the size of their neck. Some buckets will require a stopper, others have a small gasketed hole for airlock placement. An airlock filled with water or cheap vodka will be required as well. Temperature Control (optional): An important part of the fermentation process is the temperature at which your beer ferments. Yeast is able to warm the fermenting beer several degrees above ambient temperature. Warm fermentations (75F and up) can create off flavors and create fusel alcohols, which will make the beer taste like hard liquor. You can use a mini fridge with a temperature controller, or place the fermenter in a tub of cold water to control fermentation temperature if you feel it will be an issue. After 2-3 weeks, your beer is ready to bottle or keg. We also have a guide on how to bottle your beer from an automated brewing system. 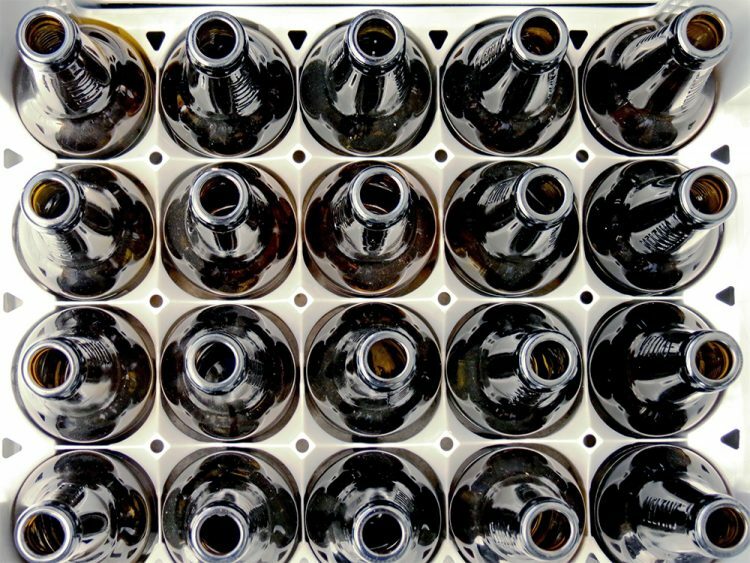 Bottles: You will need about 9-10 bottles for every gallon of beer made. You can re-use craft beer bottles. Try to avoid green or clear beer bottles. Screw-neck bottles also must be avoided. Siphoning equipment: This includes an auto-siphon and siphon tubing. This will allow you to move the beer to a bottling bucket, or directly into the bottles. Caps: You’ll need beer caps to seal the bottles. Beer caps are not reusable. Oxygen absorbing caps are available as an upgrade. They will help reduce oxidation in your beer (which reduces flavor). Capper: A capper will crimp the caps onto your filled bottles. The two more popular styles are two wing cappers and bench cappers. This is a very basic list of the equipment you need to brew your own beer, and there are plenty of upgrades you can buy to make your beer better and more efficiently. Happy brewing everyone.